Welcome everyone to the first SAP BW on HANA tutorial for this website. Before we get to the tools and the system, let’s spend a few minutes understanding what you are getting yourself into. 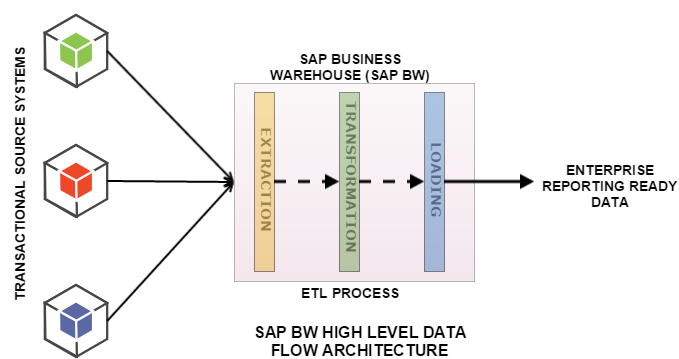 What is SAP BW (or Business Warehouse)? And if you are completely new to SAP, please spend a few minutes on post – What is SAP ? Well, SAP BW is SAP’s own Data Warehousing solution. What is data warehousing? Excellent question again. When a company does business, it stores the data of its transactions (transaction data) in some database or the other. There might be one such database of multiple – one for each region or division or one for each company they have acquired over the period. The possibilities are endless. The point being that a company’s transaction data may be spread across systems, stored in different formats in each of them and may not be in the format that the management needs to see in their reports. For a business to actively understand it’s underlying problems, understand market trends, create forecasts and make decisions, high quality reporting solutions have to be created with the right Key Performance Indicators (KPIs) of the company being measured across time frames. These KPIs and attributes that a decision maker would want are usually scattered across the database and more often than not, many of them need to be calculated from the existing data. Data warehouses cater to these needs and SAP BW is a time tested solution for large and small business alike with standard content also available for multiple industry segments to reduce implementation time. To solve this, the concept of data warehouses came into existence. Data warehouses are applications on a separate database that take data from these source systems, cleanse it, apply business logic and optimally store it within themselves for faster access from reports. It is not something SAP came up with, data warehouses have been around for a while. SAP’s data warehouse has the name SAP BW. Oracle’s data warehousing solutions are one of the biggest competitions SAP BW has had to deal with over time. I hope you now have a fair idea of what SAP BW actually means. Let’s move to the next tutorial to start our road to BW running on the HANA database.